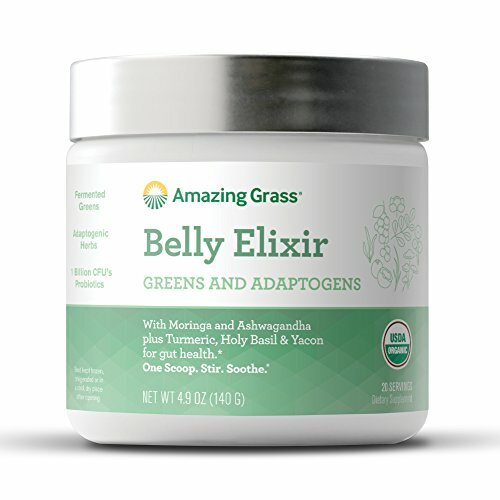 Belly Elixir is a delicious USDA organic powder blend combining our farm fresh greens with adaptogenic herbs and pioneering functional ingredients to help support digestion and optimal gut health. Supports digestion & gut health with our digestive blend crafted with 1 billion CFU probiotics, Action™ Kiwi, Turmeric, Holy Basil, Yukon, Action™ Kiwi, Cardamom Seed, Yacon Root, Ginger Root, Peppermint Leaf and Astragalus. 20 Serving Tub, 4.2 Oz. Add one scoop to 12 Oz or more of water, juice, non-dairy milk or to boost your favorite smoothie.